I needed an audio book for a road trip, so I looked on the library's site to see what was available. I LOVED I've Got Your Number by Sophie Kinsella and decided to give another one of her books a try. This book was just okay for me. If I were reading a print copy, I may not have finished it. Since I was stranded in the car for 12 hours each way to and from Vermont with nothing better to do, I kept listening. Laura Lington is a twenty some year old girl from London. (The narrator had a British accent, which was a bonus.) When we first meet her she is getting ready for her Great Aunt Sadie's funeral. Sadie died at the age of 105 in a nursing home where she had been living for many years. Her remaining family never really knew her, but Laura's Dad and his brother Bill agreed to hold a funeral. During the service Laura is approached by Sadie's ghost demanding that they stop the service. She simply can't leave this world without her dragonfly necklace. Laura is the only person who can see Sadie, but she proceeds to stop the service by declaring Sadie was murdered and there needs to be an investigation. Laura has been under a lot of stress lately and thinks she is finally going crazy. What other explanation could there be for seeing and hearing a ghost? Sadie appears to be close to Laura's age in her ghostly state and loved the twenties. Not only does she want Laura to find the necklace, but she plans on living life to the fullest while she is still here. She talks Laura into asking an American business man named Ed out on a date and wants her to dress in vintage 20's clothing and makeup. She agrees to go along with the ridiculous plan because she wants to do something nice for Sadie. She didn't really know her while she was living, but she is determined to make it up to her now. Throughout the story Laura and Sadie develop a real friendship and begin to use their talents to help one another. They are a great team and with Sadie's help, Laura is finally able to get her personal and professional life back on track. It was a nice story with some surprising twist at the end, but I was never engaged to the point in which I couldn't stop listening. I really enjoyed the portion of the book where Laura takes Ed on a tour of London. I went to London last September and visited all of the same locations, so I could totally relate. I just wish there had been more interactions with Ed. Those were definitely the high points of this story. 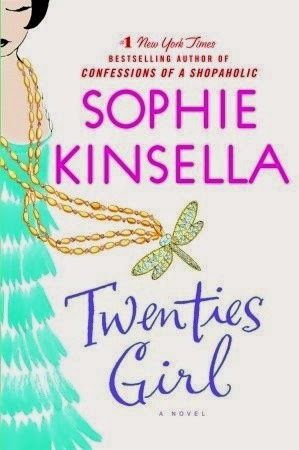 I've heard great things about all of Sophie Kinsella's Shopaholic books, so I will probably read the first book in that series the next time I want a Kinsella book. Unless this is the ONLY Sophie book you haven't read, I would probably select one of her others before starting this one.